As many local governments look for ways to engage an increasingly online-only portion of their populations, the problems ahead seem daunting with few, or sometimes no, easy solutions. The truth is, online civic engagement is hard. But, if you follow a pretty easy recipe - and one you’re already using for other civic engagement activities - you can achieve a much higher participation rate than you currently see, all while getting actionable feedback from your citizens. Receiving actionable feedback in the online-arena comes from following four simple, yet regularly overlooked steps that you are probably already doing. Like town hall meetings, direct mail surveys, or publications you are sending out like a newsletter or regular email, online engagement starts and ends with YOU! YOU must: describe what you want, time your issue, act as your own champion, and reward your citizens. The key to activating your constituents is describing what you want. Are you looking for input on a budget item? 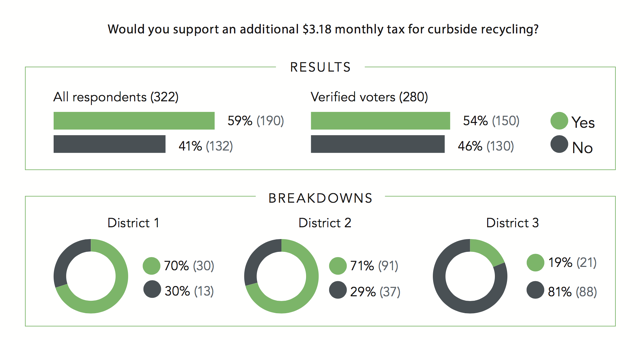 How about some deeper insights to a recent town survey? Your citizens will engage on any number issues that you need feedback on, all you have to do is ask! Verona asks a multiple choice question with responses that would provide further clarification on citizen sentiment from a recent community survey. Purcellville is seeking input on a proposal that was recently submitted to the Town Council. Both questions clearly lay out what information the town needs, in a way that is easy for citizens to either make a decision, or seek further information. This is a great way to start your online civic engagement process! As with any communication, timing is important! When meeting constituents online, you should be mindful of the multitude of other online communications they receive, as well as when and how they receive them. Generally speaking, you want to solicit feedback on a weekday, preferably between 8:30 and 10:30am for email or between 3 and 4pm on Facebook. These times of heightened internet usage (and email open rates) will give you a better chance to catch you audience quickly, before dozens of other emails, tweets or facebook posts push your content to the bottom. Post early and often! Unlike voting on Polco (where each verified voter can only post a single response), reposting or embedding your question in multiple channels is highly encouraged! First, since you’ve connected your official Facebook and Twitter profiles to Polco, the question will immediately post on your social media pages. Later in the afternoon, embed it on your website. Send it out in your weekly email. Have Councilmembers distribute the question in constituent updates. Start this all again, at different times or in a different order, in week two. When it comes to engaging your citizens online, you must break through all the other news alerts, retweets, Facebook tags, and spam mail. You need to let them know their voice matters, and you want to hear it. Finally, you must recognize and reward your citizens. This doesn’t necessarily mean taking the top option from your recent survey or municipal poll and turning it into policy or practice. In fact, you should realize that there will be a great number of times where you actually have to go against the top response, and that’s OK! What you should do is communicate why you took your chosen path with your constituents. Closing the feedback loop - providing an outcome after you asked a question and your citizens engaged - is perhaps the most important step in this process, and could be the reason your citizens continue engagement in the future. Whether they agree or disagree with the ultimate decision, it will be this communication that they appreciate - the recognition that their voice was heard. In the end, adopting any or all of these practices into your regular civic engagement strategy will increase participation rates and improve the quality of feedback you receive from your citizens. Municipal polling or engagement doesn't have to be all or nothing, and we hope that these tips from our experiences will help your locality meet more of your citizens where they are - online!